MAHA is a diverse association which provides information on recent research, social events, lectures, the opportunity to exchange ideas and a meeting point for all ancient historians and enthusiasts within the university community, schools and anyone with an interest in the subject. Fully accredited intensive summer course on the archaeology of Ancient Israel and the Near East during the biblical period, at the Hebrew University of Jerusalem, Israel. To what extent can we trust the Biblical narrative? How does it stack up against evidence from archaeological and extra-biblical literary sources? This is a unique opportunity to explore the issues with world-leading experts on Ancient Israel and the Near East in an engaging course designed for teachers. The course includes illustrated lectures and visits to famous sites & museums. It is accredited with NESA for Professional Development.See more information and the full program here. Go on an archaeological dig. January – February 2020. Be part of a new archaeological excavation at the site of Khiret el-Rai (nearby to Lachish and approx. 60 kms SW of Jerusalem) Channel Indiana Jones as you join a unique archaeological dig directed by Macquarie University, Hebrew University and the Israel Antiquities Authority. This dig will train you in the latest scientific archaeological techniques while seeking to resolve a burning question – was there ever a united monarchy under King David and Solomon? Was this crucial site occupied by Canaanites, Philistines or Judahites (Israelites)? What can the archaeological evidence reveal? Teachers can participate in the course, the dig or both. Registration now open: for program and registration go to MALS website. The Coinage of Ephesus The Ephesus Coinage website was designed to make the diverse collections of Ephesian coins available to the students of the Department of Ancient History, and to the wider public. The Coinage of Julius Caesar The web exhibition Julius Caesar highlights some of the 800 coins in the Gale Roman Republic Collection, an invaluable resource for the teaching of Roman history and numismatics. The Macquarie Asian Historical Research Society (MAHRS) was founded by PhD Candidates at Macquarie who felt a need for greater rapport between fellow students who had research interests in Asian history. MAHRS is not only a society, but a forum within which members may discuss and contest ideas on aspects of Asian historical cultures.We aim to keep our ‘ears to the ground’ and to inform our members of the goings-on in Asian historical research in Australia and abroad. Visit the Macquarie University Ancient History youtube channel to watch clips on archaeological method and practice filmed onsite a Macquarie dig at Khirbet el-Rai, Israel in February 2018. These resources have been developed for the Museum of Ancient Cultures with the generous support of Walanga Muru. Macquarie University would like to acknowledge the Roth families whose generous support has allowed the development of this site. Cartoons, podcasts and blogs - exciting classroom resources to immerse your students in ancient Rome. Stephen Hodkinson, "Transforming Sparta: New Approaches to The Study of Spartan Society", Ancient History: Resources for Teachers, Macquarie Ancient History Association, vol.41-44, 2011-2014. Click here for free full text digital copy of this article. The Top Ten of Ancient Greece! 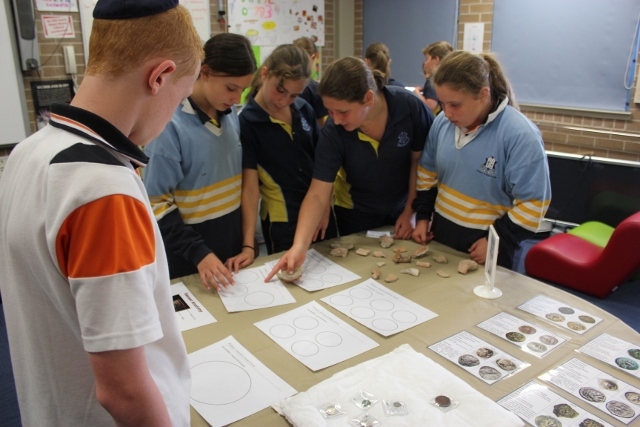 Find information about studying Ancient History and Archaeology at Macquarie University. Boost your research! Visit History Resources for High School Students to find useful tips and guides for using the Macquarie University library for your school research project. Ancient History Teachers' Panel Discussion at Macquarie University with Mr Darren Taylor, HSIE Inspector, NESA. 14 November, 2016. 'History or Literature? (The Origins of ASCS)', by Emeritus Prof. Edwin Judge AM, read by Prof. Alanna Nobbs AM - Part 1 of 2. 'History or Literature? Or how we fell into this bind' (follow up presentation) by Emeritus Prof. Edwin Judge AM - Part 2 of 2.